Samsung Digimax U-CA5 introduction : When it comes to digital cameras, consumers are always searching for the latest, most advanced features and technologies in easy-to-use and affordable packages. At PMA 2005, those consumers will find what they are looking for in the new Samsung Digimax U-CA5. The Samsung U-CA5 boasts a 5.0 Megapixel image sensor, is available in Neo Gray, Neo Wine or Neo Blue, features 9 scene modes, an impressive combination of automatic and manual controls, and MPEG-4 video compression, all for a street price of only $289.99. "Like the entire U-Series line, the Samsung U-CA5 is stylish, compact and easy to use, however, it's packed with a host of new, high-end features and capabilities that bring digital creativity and personalization to a whole new level," said Ken Gerb, Senior Vice President, Sales for Samsung Camera. 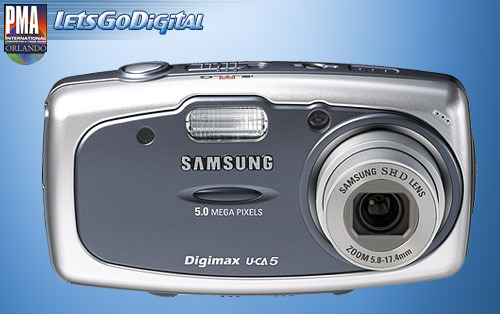 At the heart of the Samsung Digimax U-CA5 is a 5.0 Megapixel, 1/2.5" CCD image sensor, designed to take quality images in its fully automatic mode, while still providing the photographer with a host of manual controls for more creative photographic applications. The Samsung Digimax U-CA5 features 9 scene modes (night, portrait, landscape, text, close-up, sunset, dawn, backlight and beach/snow) and 7 white balance modes (auto, daylight, cloudy, fluorescent H, fluorescent L, tungsten and custom) which ensure that the user will always have the ability to capture the perfect shot. The Samsung U-CA5 also comes packaged with a stylish cradle, which gives the user the ability to quickly and easily upload images to their computer, and at the same time, recharge the camera's Li-Ion battery. In addition, the Samsung Digimax U-CA5 boasts 6 flash modes, including a Safety Flash mode, allowing shooters to be confident that proper light will never be a problem. The Safety Flash is an extremely beneficial feature that, when in use, will automatically resolve red eye effect. For an added level of personalization and fun, users can take advantage of the Samsung U-CA5's three special effect modes; Highlight, Composite and Photo Frames. Highlight enables the shooter to emphasize a subject by putting its surroundings into soft focus. This is made possible using digital processing within the cameras. With Composite, users have the ability to divide a shooting scene into 2-4 segments and save it as a single file, while Photo Frame allows users to add a frame to an existing image. Another of the Samsung Digimax U-CA5's creative features is its RGB Color Effect mode. This unique feature allows users to adjust and customize the levels of red, green and blue in all of the images stored on the camera. In essence, the RGB function allows users to create multiple versions of a single image, all with different levels of depth, tonality and richness. The Samsug Digimax U-CA5 utilizes SD/MMC external memory (up to 1G guaranteed), which is quickly becoming the preferred storage media for compact digital cameras thanks to the format’s ability to pack a large amount of data into a small space. The camera also records MPEG-4 VGA (640x480) video at up to 30 frames-per-second with audio. Compared to MJPEG compression, MPEG-4 can record up to 3 or 4 times longer. In fact, the recording time is limited only by the capacity of the external memory card in use at the time. Video playback, as well as viewing photos, is made easy with a colorful and easy to use GUI (Graphical User Interface) accessed through the camera's 1.8" TFT LCD. Users can also trim, resize and rotate selected images right on the camera and can print directly to a PictBridge compatible printer, all without the need of a computer. With its combination mechanical and electrical shutter, the Samsung U-CA5 digital camera has a top shutter speed of 1/2000 of a second, and can capture long exposures up to 15 seconds when set in its Night scene mode. A sharp, precise, 5.8mm - 17.4mm f/2.8-4.8 lens (equivalent to 35mm-105mm in 35mm film format) gives the photo enthusiast a high quality picture in any situation. A built in 5x digital zoom further extends the lens' capabilities. The Samsung Digimax U-CA5 also includes an Auto macro mode that focuses as close as 5cm, something few cameras in the class can boast. With the Auto macro function, the Samsung Digimax U-CA5 automatically adjusts shooting distance and focus. Shooters can press the macro button in Auto mode to set the cameras to adjust distance and focus automatically from 5cm to infinity, providing crystal clear images regardless of the shooting range. The Samsung U-CA5 is able to meet the needs of the most critical of photographers. Thanks to preset shooting modes and custom effects, it's possible to adjust the camera to meet any photographic challenge. Three sharpness modes, four effect modes (including B&W and sepia), seven white balance settings, and a variety of shooting modes further extend the capabilities of the camera.